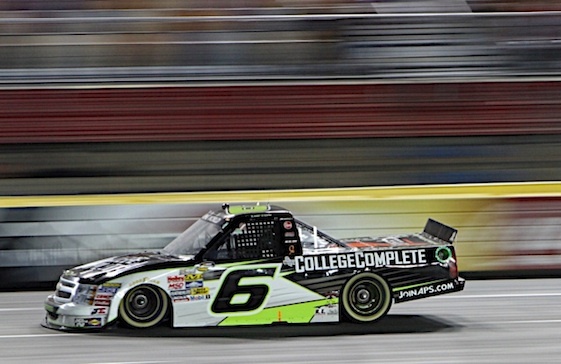 CONCORD, N.C. – For NASCAR Camping World Truck Series owner Eddie Sharp, Justin Lofton’s first career victory in Friday night’s North Carolina Education Lottery 200 at Charlotte Motor Speedway was a gamble that paid off. Lofton simply viewed it as the fifth move in a chess match. For Sharp, Lofton and crew chief Daniel Bormann, Friday’s victory merely reinforced something they already knew – that they needed to tackle the racing business together. In 2009 Sharp and Lofton won the ARCA RE/MAX Series championship and then parted company. Lofton wanted to move to the next level in his racing career and Sharp wasn’t in a position to go with him. In 2010, Lofton drove for Tom DeLoach’s truck team. He then moved to Germain at the beginning of 2011. However, by last year’s 10th race, Sharp and Lofton had reunited with Bormann. “Life is about making decisions and sometimes decisions are made for you,” Sharp said. “Right after the Texas race last year, I had Craig Goess driving for me and his father called me that Monday and quit. That was all the business I had going through my doors. I sat there for almost a week and tried to figure out how I was going to pay these guys. A few months later Kevin Harvick announced he was closing his truck operation. Sharp took a major leap and purchased the Kevin Harvick Inc. equipment. Friday night, the confidence the men had in each other, as well as that supplied by Lofton’s father, paid dividends. Lofton led twice for 44 laps in the 134-lap event, including the final 10. It was the decision not to pit for fuel late in the race that gave Lofton the edge he needed, but made Bormann a nervous wreck on the pit box as the laps wound down. Lofton, who started second in the event, averaged 109.786 mph in the race that had eight caution flags for 36 laps and eight lead changes among seven drivers.